Nominations are open for two awards given to Auburn University College of Veterinary Medicine alumni that recognize early career success and lifetime achievement. The Wilford S. Bailey Distinguished Alumni Award is given each year to alumni in recognition of their outstanding achievements to the veterinary profession. 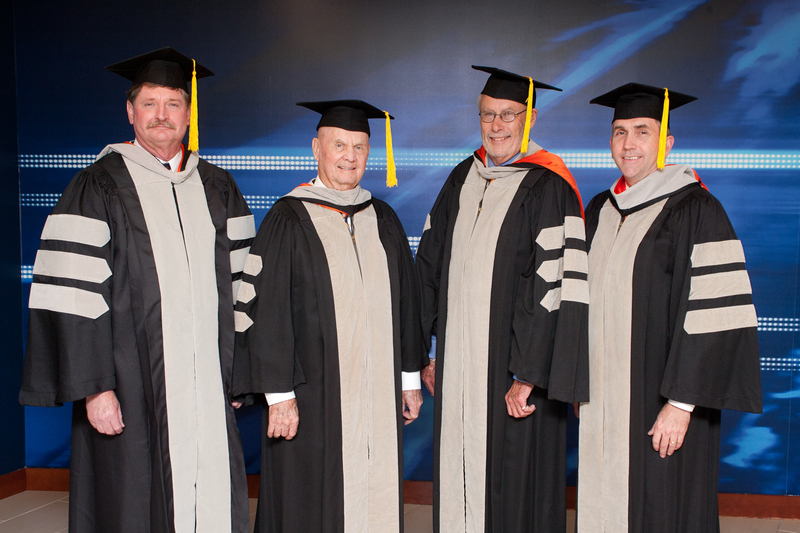 The recipients are to be honored in May during the college’s commencement ceremony. The Young Achiever’s Award recognizes alumni who earned their DVM 10 years ago for early-career accomplishments in veterinary medicine, outstanding community service and for the advancement of animal health. Members of the Class of 2006 are eligible for the recognition. Both awards are bestowed by the College and are chosen by alumni who are members of the college’s Alumni Advisory Council Awards Committee. 2015 Wilford S. Bailey Distinguished Alumni were, from left: Dr. Ron Prestage ‘82, Dr. Loyce Turner ‘48, and Dr. Taylor Bennett ‘69 with Dean Calvin Johnson. This prestigious award is given to Auburn alumni who have distinguished themselves by promoting animal health, advancing the veterinary profession, and serving their communities. It is named to honor the late Dr. Wilford S. Bailey, who held a 50-year continuous faculty appointment at Auburn, serving in positions ranging from instructor to university president. Dr. Bailey was the first recipient of the Auburn University College of Veterinary Medicine’s Distinguished Alumnus Award. Following his death in 2000, the award was named in Dr. Bailey’s memory. The candidate must be a living alumnus of Auburn’s College of Veterinary Medicine. This includes not only those who obtained professional degrees, but also those who received advanced degrees. The nominee should be known for his or her accomplishments in veterinary medicine and/or have made an outstanding contribution to his or her community and the advancement of animal and human health. Awardees are recognized during the college’s Commencement Ceremony. 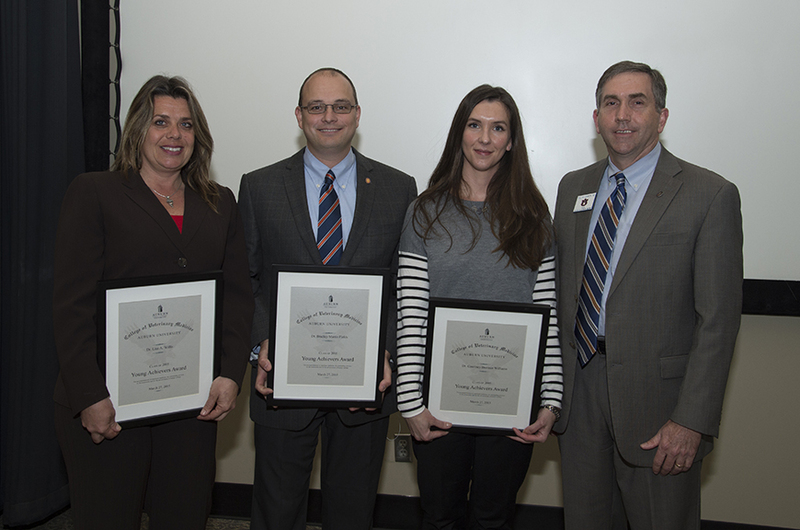 2015 Young Achievers Awardees included from left, Dr. Lisa Willis, Dr. Brad Fields and Dr. Courtney Bronner Williams, who are photographed with Dean Calvin Johnson. The Awards Committee of the Alumni Advisory Council seeks nominations for the Young Achiever’s Award for the Class of 2006. The Young Achievers award is given to one or more members in the Class of 2006 for their accomplishments in veterinary medicine, outstanding community service and for the advancement for animal health. The Awards Committee of the Alumni Advisory Council will review the nominations and select the recipients. Young Achiever’s will be honored April 1, at the opening session of Annual Conference. The candidate must be a DVM graduate of the of Auburn’s College of Veterinary Medicine. The nominee should be known for his or her accomplishments in veterinary medicine and/or have made an outstanding contribution to his or her community and the advancement of animal and human health in the 10 years since graduation.